BASF Corporation awarded 20 New Jersey public schools $5,000 each to support science education programs in 11 of the 21 counties in the state. The awarded grants will enhance science, technology, engineering and math (STEM) related initiatives for students grades K-12. "Our goal is to engage students in creative new ways that will stimulate their interest in STEM-related fields and encourage them to view science as a long-term field of study and possible career path," said Robin Rotenberg, Vice President and Chief Communications Officer for North America at BASF Corporation. "Through the programs supported by these grants, we hope to develop the innovators and scientists who will shape our future." Each year, BASF invites all New Jersey public schools to submit a proposal summarizing their specific science education needs and how a grant would help students explore STEM. This year, we received 70 proposals from 18 counties. 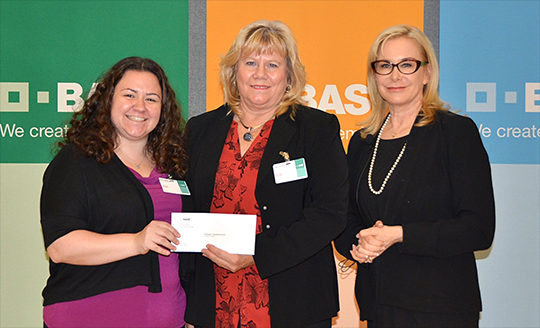 BASF presented the 2015 Science Education Grants to Delaware Township School in Hunterdon County, during a reception at the company's North American headquarters in Florham Park.